Monday 6th March 2017 is the CWCF AGM. The positions of Chair, Vice Chair, Secretary, Treasurer and the committee will be elected and the Terms of Reference voted on. The redevelopment of the site currently occupied by Decathlon on the waterfront will bring new retail and leisure facilities, as well as hundreds of new homes to Canada Water. Work on the first phase of the development will deliver 234 new homes, within a landscaped open space. This phase will see the arrival of the new Decathlon store with a purpose built customer car park in its basement. Decathlon will remain open in the south store for the duration of the redevelopment. 397 new trees will be planted as part of the regeneration of Canada Water. As part of the redevelopment, 40 trees currently on site are to be removed to enable Phase 1 to be built. None of the trees affected are under tree preservation orders and all will be replaced elsewhere on the development. This work will begin this month. In accordance with the Localism Bill, Rotherhithe and Surrey Docks wards are combining to form a Neighbourhood Planning Forum where local residents and businesses can plan the economic, social and environmental development of the area. With an expected population increase of 8,000 it was important to collectively address the impact this will have on existing residents and all were urged to get involved. An application to be recognised as a designated body had been submitted to LBS. the council has begun it's 6 week consultation on the Rotherhithe and Surrey Docks Neighbourhood area, details are available on our website here. The consultation will run from 17th January until 28th February 2014. Whilst we can see some logic ,from a Council perspective,to the Council seeking to exclude the development sites of the Shopping Centre and Harmsworth Quay we disagree with the Council proposal. There seems no justification to exclude Surrey Quays Leisure Park this site from the Neighbourhood Planning area. Further to exclude the Canada Water Area Action Plan core area which include many sites already developed with residential (such as the Canada Estate,Albion Estate,Albion Street,the Business Centre and others) and therefore the residents and businesses in those areas would also be excluded from membership of the Neighbourhood Forum, for which we cannot understand the rational. In addition flies in the face of our stated aim of including all the residents of the area and given a large proportion of the core area includes Council and social housing would in planning terms create a two-tier area, a situation that we are keen to avoid. 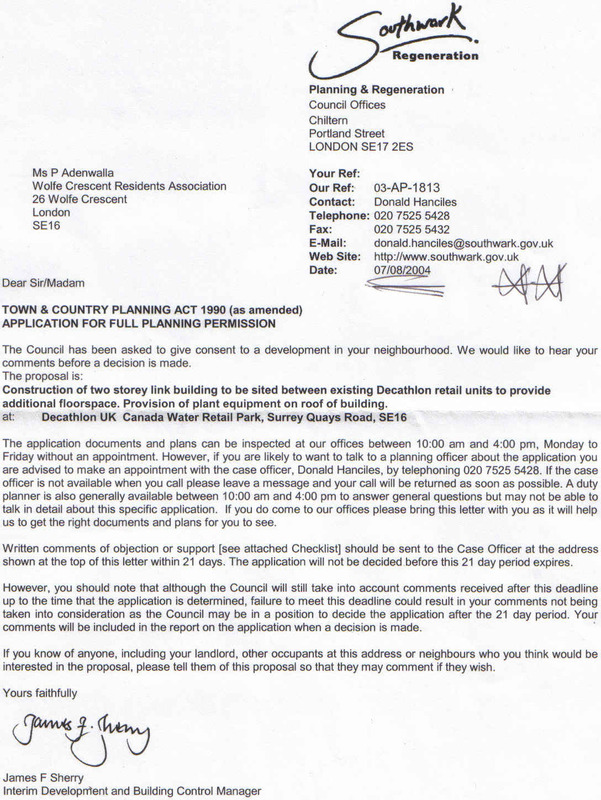 As we have stated on a number of occasions we have written to all tenants and residents associations in the area offering to provide speakers to outline neighbourhood planning and our proposals. Before submitting the application the proposed area was considered in detail and we felt that to ensure that development brought the best social, environmental and economic to the area and the residents the area we originally proposed was the optimum area for consultation and involvement, a view endorsed in the results public consultation. Therefore we would ask LBS to reconsider your proposals to exclude the Canada Water Action Area Plan core area from the Rotherhithe and Surrey Docks Neighbourhood Planning Area and endorse the area originally proposed. As LBS will know residents in the Canada Water area have been involved in planning the area for over 14 years and often feel that opportunities have been missed particularly with the provision of affordable housing and residents are keen to have more influence in planning the area where they live and work. We trust that LBS will consider the points we raise and look forward to their reconsideration and response. Happy Valley 200 seater chinese restaurant has been granted an alcohol and Karaoke music licence until 11.30pm for B6 unit under Montreal House. There are issues regarding the windows and internal layout. 12-AP-4126 – granted 5/11/13 Demolition and extension applications. A language school has taken over all the commercial units. 12-AP-4126 – granted. 14-AP-3176 Portacabins for Decathlon’s offices. QUEBEC WAY INDUSTRIAL ESTATE / 36P (Ampurius- Woodland Views Ltd.) 11-AP-2565 granted 28/2/12 for 366 dwellings, gym, nursery school and small convenience store. Work is progressing on site. 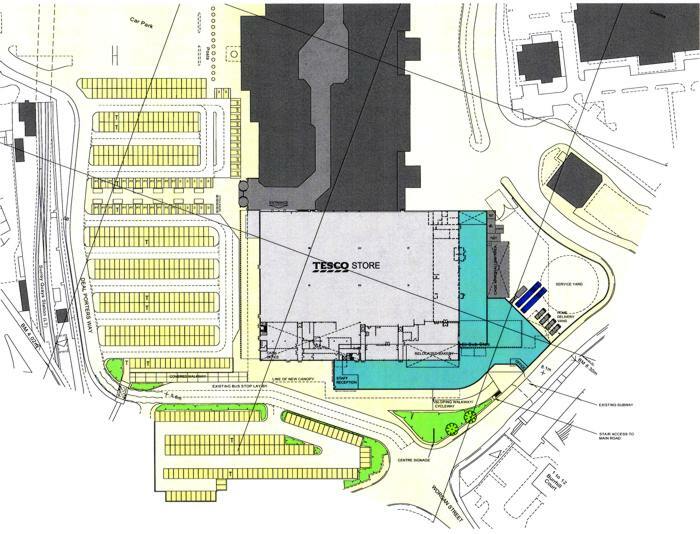 SITE G / 33P SHOPPING CENTRES LTD.
11-AP-4206 for extension granted following a judicial review. A new proposal is imminent. rats are much in evidence. Discussions have been held with LBS as people are of a view that there is a need to have a Plan B both short term and long term - as hoping for monsoon rains is perhaps somewhat chancy. The Family of Dolphins sculpture by David Backhouse is 2.74m. The work formerly stood within an ornamental pool within Surrey Quays Shopping Centre. The dolphin theme was arrived at as the shopping centre had a maritime theme; it has no other known direct correlation with the area. It has now been kindly gifted to Southwark Council. In order to enable us to hear from the community we are undertaking a consultation about the new location for the sculpture. Southwark Council would like you to use this eform to tell them where you think the work should be sited (please be as descriptive as possible and include road names) and why you feel that it would be a good location. It would be helpful if you could include your contact details so that we might be able to contact you if we aren't clear which location you are referring to. Security will be required and ideally we would site this somewhere where the area is already being monitored by Southwark Council CCTV to mitigate the chance of theft. The opportunity for vehicular access to the site should also be difficult, again to mitigate the chance of theft. The space itself needs to be large enough to accommodate the art work which is 2.74m. There will be a requirement to dig foundations to secure the work. Water based locations can be considered given its former use. If the site is not water based then an appropriate plinth treatment will be required. Canada Water plaza is not an option due its function for markets and performance. Land must be Southwark Council owned or alternatively be publically accessible and have the potential for the owners' permission being granted. We are looking for locations in the Canada Water area. Southwark Council staff will then undertake feasibility on all of the locations suggested. Viable options will be presented back to the community onlineand at Canada Water Library. Here you will be given the opportunity to make comments which will enable officers to make a final decision about the location. Planning applications for Site C and E submitted 12-AP-4126 . CW-AAP to go to cabinet 14th May. Public consultation will follow. DMGT have assigned their lease to BL. King’s College has expressed interest in developing a campus on the site. Site A application 09-AP-1870 Blocks A4 / A5 nearing completion . SITE G SHOPPING CENTRES LTD.
British Land 100% leaseholder of SQSC having acquired Tesco’s 50% holding. Application 11-AP-4206 SQSC granted 27/3/12. Subject to a JR.
Acquired by King’s College London. Planning application imminent. Online comments from the 27 March to 19 April 2013. As construction at Maple Quays draws to a close, Barratts have booked to remove the passenger hoists and tower cranes during February and March. The tower crane removal will involve having to close Surrey Quays Road for a period of time. Details of specific dates and times will follow. occasions to a minimum and control the works appropriately so as not to cause any nuisance. The removal of the protective scaffold over the Canada Water tube entrance will also take place in February and, due to London Underground restrictions, will also have to be done on an evening. We expect this to take one week and will advise on dates once confirmed. Harmsworth Quays lease is to assigned to British Land. Details here. 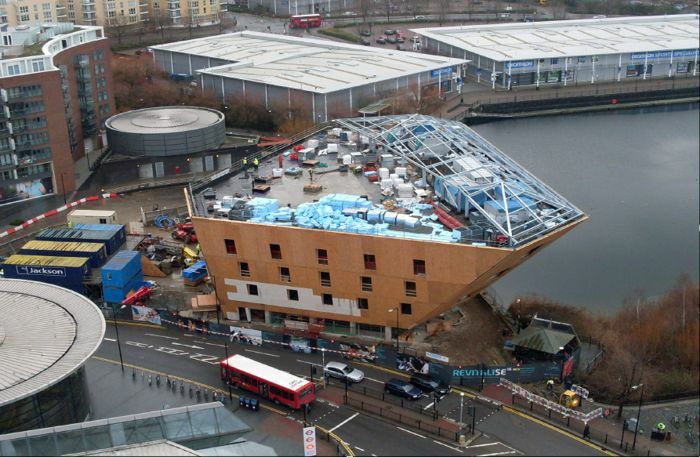 Complex construction of Decathlon's underground car park given the volume of water in Canada Water lake. A consultation by Sellar's on their development proposed for Sites C & E was held at Canada Water Library on 17th, 18th (12:00 - 20:00) and 19th May (09:00 - 16:00). Sellar Design & Development became the co-owner of sites C&E last year. Site C contains the two Decathlon retail stores and the relocation of this retailer into a single, purpose built unit to the north of the site is a prerequisite to the comprehensive redevelopment of thissite. Site E contains the temporary 'What!' discount store, which will leave the peninsula when development commences. Sellar has begun design work on a full redevelopment of the sites that will deliver the expanded town centre described in the Council's Canada Water Area Action Plan. 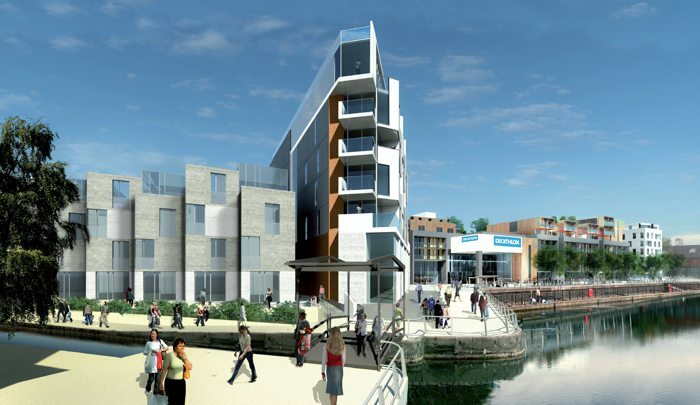 As well as Decathlon they intend this to include new shops, cafes, food-hall, restaurants and around 1000 new homes within a landscaped, predominantly pedestrian setting alongside the former dock. This first stage consultation event will provide an opportunity for the wider public to view the initial proposals and provide comments and guidance to the Sellar team. Architects, landscape designers, planners and engineers will be present along with the Sellar client team to discuss these matters with visitors. 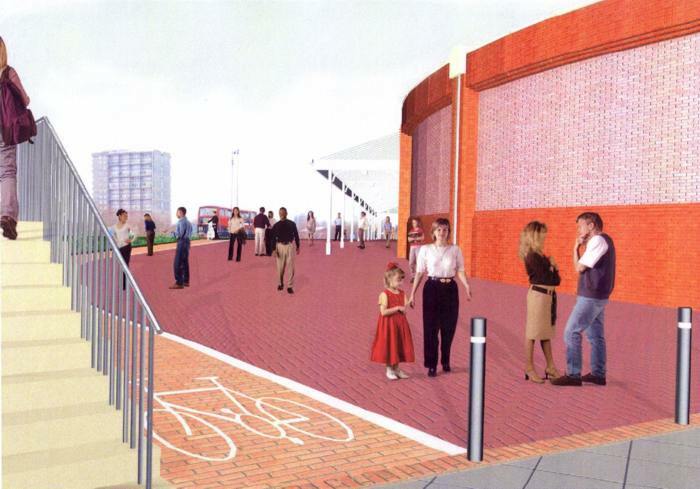 On 27/3/12 the LBS planning committee approved the SQSC circa 30% extension and refused the car park deck. 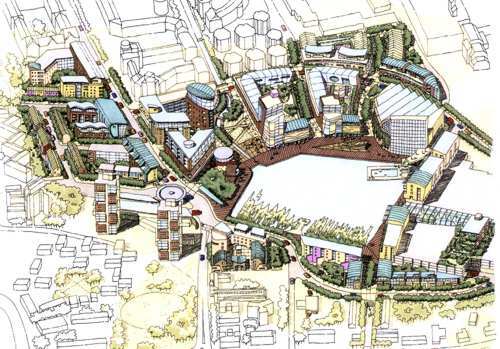 The design panel raised significant concerns over the SQSC scheme principally over its lack of ambition in the context of the emerging town centre and its poor relationship with Canada Water Basin (para 94). The application stated that the operational phase of the development will generate up to 467 full time equivalent permanent jobs for local people and the case officer's report indicated that this significant benefit was of considerable weight in the assessment of the acceptability of the extension proposal (para 32). The officers' report also mentioned missed opportunities for pedestrian routes (para 57/58). and the fact that LBS as a whole experiences high expenditure leakage (para 40). It is to be hoped that the implementation of 11-AP-4206 (SQSC extension) is a success for the community. LBS will be consulting on the draft strategy until Tuesday 24 April 2012. Wednesday 18th-Friday 20th January, 2pm-8pm each day. Thames Tunnel Phase 2 Public Exhibition, City Hall, The Queen's Walk, SE1 2AA. An opportunity to see Thames Water's revised plans for the super sewer, to question TW personnel and repeat our demands that King's Stairs Gardens must not be considered as a back-up option or a potential site for any works. The more of us who go along, the stronger our message will be! St Peter & The Guardian Angels Social Club, Paradise Street. Our next public meeting to review the state of play just before the crucial Phase 2 consultation ends. You are all very welcome to attend - please come along to find out the latest developments in our campaign. THE VERY LAST CHANCE to submit your Phase 2 feedback (but why wait until then?) - it's essential we all give our own feedback, and encourage everyone we know to do the same, to make it clear to Thames Water that opposition to any plans they may have for King's Stairs Gardens is still as numerous, strong and united as ever. Don't let them revive their dreadful plans for our park by thinking we've shut up and gone away! How to respond? It's easy - a simple letter or email will do. See our guidelines at www.saveksg.com or on our Facebook Page or pick up a paper copy at The Angel - why not email or write to Thames Water now? Surrey Quays Road is to close 9th-11th January 2012 (click here). Following on from the successful opening of the new library on 28 November, we are now in a position to complete the final elements of the new plaza. Subject to the great British winter, we aim to complete the plaza by the end of February. If we get a lot of snow this may be extended slightly, but we are have a great team doing the works on site and we are expecting to meet the end February timeframe. As the new library has completed and opened we have been recieving a number of queries about the old pergola which sits to the west of the library and new tube station entrance. The original plans were to clean the structure and leave it in-situ, and we have made provisions for this. However, my colleague Anna Devlet at British Land and I have been made aware of a level of interest from the local community in having the structure removed and to open up the views of the new landmark library building, basin and historic dockside. The new library provides some nice spaces for shelter which could replace the use of the pergola in the longer term. If you have any strong views relating to the removal of the pergola, could you please let me know over the next week, if possible by 21 December. Following the refusal of the planning application to install the temporary marina by Planning Committee on 28th November, Laurens Winkel (the Chairman of the company) has written to LBS to say that he will accept the decision of the planning committee. He had been considering a revised application that further reduced the numvber of moorings by 80 and moved the moorings to the east end of the dock away from the nesting stations. After a 10 year campaign, Lewisham Council at last accepted the communities objections to the size and scale of this development; the Developers proposed failure to included the sites Historical Importance; to create Jobs or to deliver affordable Social Housing. Sellars, the developers for The Shard, have recently acquired the freehold of Site C ( Decathlon) and Site E (What Store). The will present their vision for the Canada Water area at the next meeting of the Canada Water Consultative Forum on Monday 12th September 2011 at 7:00pm at Alfred Salter School. Also at that meeting British Land/Shopping Centres Limited will be presenting their vision for the shopping centre. Everybody is welcome, and encouraged, to attend the Forum meetings. The Quebec Way Industrial Estate comprises three industrial warehouses with attached office space, all built in the late 1970s. The buildings are now nearing the end of their expected life. The owners are proposing to redevelop the site into a sustainable residential neighbourhood, with community facilities, within a carefully landscaped setting, enhancing the adjacent woodlands and preserving the area's uniqueness. They are keen to develop their plans in close liaison with local residents. and the local residents at the public exhibition, they have made several changes to their proposals. The planning application for 366 dwellings on Quebec Way Industrial Estate will be discussed at the CWCF meeting on Monday 12th September 2011 at 7:00pm at Alfred Salter School. .
Over the next fortnight (May 04 2011), work will commence across the north and east elevations to install the final mesh rainscreen cladding element to the building. In order to construct the entire plaza in time for the opening of the library, LBS/BL-CQs/ Maplins need to commence a complicated phased project as soon as possible. Site welfare accommodation is required for the contractors and after an extensive scour of the area and discussions with a number of landowners, the best possible solution available to the council is to use the narrow strip of land adjacent to Deal Porters Ways - between the road and the dock (where the cherry trees are). The map (click here) shows the approximate position of the accommodation. The contractors have carried out a detailed site survey to ensure that the space will be returned to it's existing condition, and LBS highways department has approved footway diversion measures, for which there is ample room, around the side of the proposed compound. The contractors will also provide access through to the wooden pontoon over the dock for local use. The site will enable the plaza contractors to easily access the site, provide the required legal amount of health and safety accommodation, ensure they get the plaza built for the library opening, and minimises risk to the council. After it was proposed to have a temporary closure of Albatross Way, the Maple Quays Construction Team have taken cognisance of feedback from local residents and revised their method of construction. This has enabled them to remove the fencing, with a view to allowing access along the pathway during the construction works. The original plan had been to close the pathway completely for a period of up to 12 weeks, as this was considered the most efficient and safe way to undertake the necessary improvement works and remove the scaffolding on the adjacent building. In the last few days, some local residents have made it clear that the temporary closure was too much of an inconvenience and the Maple Quays Construction Team have decided to act accordingly. As a result, a fence line will now be erected through the middle of the current pathway, creating a walkway on the existing cycle path. Work on the resurfacing work will begin on the area fenced off, which will take approximately 2 weeks. Following this, the resurfaced area will become the walkway and the footpath will close over the existing cycle path. This will remain until the scaffolding has been removed safely and the rest of the resurfacing works has been carried out. Please note that there will be short periods during the day when the pathway may have to be completely closed for safety reasons. The Construction Team will use best endeavours to keep these periods to a minimum and avoid the busy commuter times of day. If you have any queries, please contact Setura Mahdi on 0845 460 6011 or by email to smahdi@hardhat.co.uk. 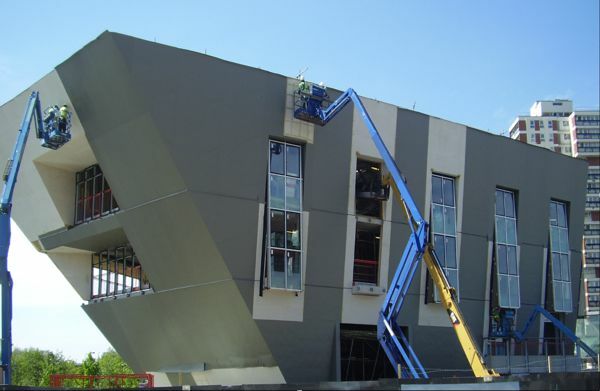 ISG Jackson is currently installing the bronze coloured membrane on the west elevation, which is the most advanced facade, and this process will continue over the month across both the north and south elevations. Preparation is underway for the arrival of the green sedum roof which will provide a microhabitat for plants and insects. Exit 2 from Canada Water station, which forms part of the library development, has been formally handed over to London underground. They are currently fitting out this entrance with the expectation of opening the exit in April 2011. Daily Mail & General Trust plans to move its printing operation from Harmsworth Quays to a new £50m development in Thurrock, Essex, it announced on Tuesday 1st February 2011. Click here for the Guardian article on the closure. We are looking for more people to play an active role in the Canada Water Consultative Forum, please e-mail canadawater@live.co.uk, if you are willing to help out. Regeneration of public communal green space along Salter Road. Canada Water tube entrance 2, which is now part of the library site, has closed until 2011 when the library is finished. Work on site B2 (Montreal House) is nearing completion and the external works to the Surrey Quays Road have started. This includes tree planting and landscaping works, due to commence in the next two months. Work on site A1 is now well underway, with the basement slab for cores 4 and 5 in place and the construction of the walls and columns for the podium progressing well. Piling for site A2 has begun, as of the 28th April 2010. By the first May bank holiday weekend, Maylim will have finished all the laying of paving to the tube/bus station including the final cleaning of the paving and removal of all fencing. The area in front of site 2 (Montreal House), is due to start on the 26th April for a duration of six weeks. These works will comprise of the full hard landscaping to the frontages along Montreal House. There are new designs for Site A, which include the introduction of a 28 storey tower, the removal of the town houses with gardens and the introduction of a series of rectangular blocks of flats. Click here to find out where public consultation comments from 2006 have been ignored. This is a serious plan to change the current leisure facilities: restaurants, cinema, bowling alley and bingo hall. Illustrations for the Canada Water Library which is hoped to open in March 2011. By now most of you must know that Jackie Rose our Canada Water Consultative Forum Administrator has very reluctantly left us. The uncertainties surrounding her ongoing funding finally proved to be too stressful for her and hence she moved back to her old job. Neither British Land/ Canada Quays nor Southwark Council were prepared to continue funding her post in the Forum,as it is, beyond March. This is the area immediately to the north of Canada Water and next to Canada Water tube station on the current derelict land. It will be the site for the new library and a lot of flats. You will notice that the heights of the development have increased dramatically from those first proposed. Some of the images are very large so please be patient whilst they load. the removal of the town houses with gardens, to be replaced by 3 bed maisonettes with flats above. the social housing to be concentrated in the rectangular blocks in the middle of the new development (estate). Revisions to the masterplan - these include public repsonses to comments in April 2006 from LB Southwark and its Design Review Panel. Where these decisions have been reversed in the new proposals it is noted below. Frogmore are planning the redevelopment of Surrey Quays Leisure Park (where the cinema, bowling alley, bingo and restaurants are). This proposal includes putting everything down one end where Frankie & Benny's/Pizza Hut is and putting all car parking underground. At the last CWCF meeting the proposals were soundly criticised by Forum members and local councillors. If you look at the proposals you will see that the new location for the cinema, bowling alley, bingo and restaurants is in ONE buildng at the Tesco end of the site. However, to get everything into this small area seems very unlikely (or a very tall building). If they were to develop the site it would mean demolishing Frankie & Benny’s and Pizza Hut and possibly the nearest end of the cinema. The restaurants are very busy and the removal of such facilities during the building works, which would probably take over a year, means the area would go back to the bad old days when they were very few facilities on the peninsula. All car parking would be underground with the ensuing security risks. When questioned at a CWCForum the developers (Frogmore) stated that security would be the responsibility of the management company – i.e. not their concern. However, we know that there is a real security risk in our area and underground car parking, with few exits in the case of threatening behaviour, would be a grave mistake. Frogmore have already said that the Odeon cinema chain have agreed on a cinema on the new site with fewer screens. There would be the issue of noise from the bowling alley into the cinema and restaurants if everything was fitted into one building. Contact Frogmore on 0870 066 8734 or email azizun.choudhury@fourcommunications.com . 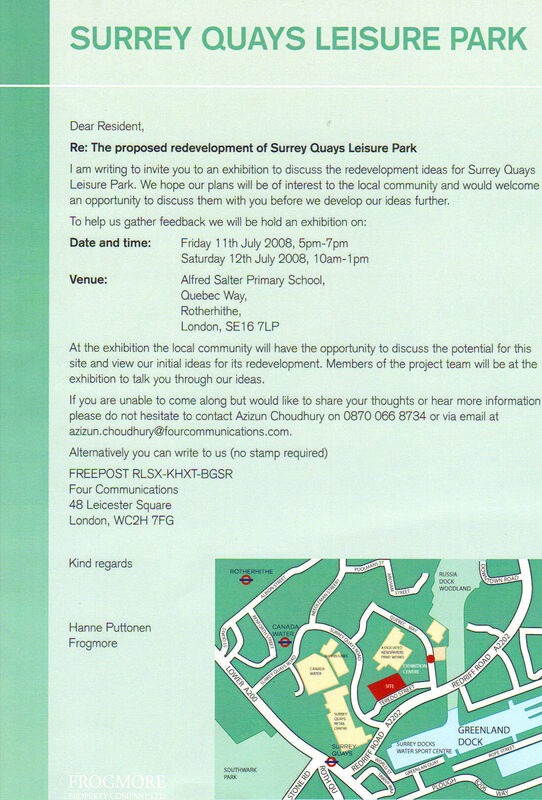 Many local residents were disturbed to read the reports in the Southwark News (1/03/07) which states that Ruth kelly had requested Southwark Council to reconsider the designation of parts of the Rotherhithe Peninsula (outside the Canada Water area), Dulwich and Nunhead as suburban in the Council's Unitary Development Plan. The only reason seems to be the objection from the Mayor of London that in his view the Southwark Plan does not conform with the London Plan despite offering no evidence to this effect during the consultation process or bothering to consult the local people of the areas in consultation or discussion of his view. In the case of the Rotherhithe Peninsula local people have been closely involved with the development of the Southwark Plan putting in their views, responding to the various consultations and attending the Inquiry on the Plan held by your Inspector. The overwhelming view of local people is that the areas outside the Canada Water area are more suburban than urban and whatever description the London Plan uses the area still fits the suburban description. The UDP Inspector considered this issue in detail and concluded: "Apart from narrow strips of land alongside the River Thames with its preponderance of flats, Rotherhithe is more suburban in character this is mainly because of prevailing low-rise dwellings and a significant amount of open-space. Some of it has sylvan quality. Public transport, mainly by way of buses, is less frequent. Rightly this part of the borough is a suburban zone and development should generally respect its existing character and densities". A fact not challenged by the Inspector at the Downtown Site Appeal Inquiry, neither did the Secretary of State raise any comments on the suburban designation of the site in her decision letter. The Mayor of London has pressed for the designation to be changed from suburban to urban without raising any justification. Could it be that the Mayor actually agrees with the local population's view for in an interview (Regeneration and Renewal 26th March 2004) the Mayor stated when describing the Surrey Quays area; "You feel as though you have been dropped into the outskirts of East Grinstead". What could be more suburban than that! The Government has always placed a high priority to community involvement in the planning process, and in the publication "Community Involvement in Planning-The Governments objectives "it states:" The community must be able to put forward and debate options and help mould proposals before they are settled. People need to feel their participation can make a difference." The community in Rotherhithe did put forward and debated the options of designating the area suburban. This was supported by local councillors, and all other political parties, by the Council and by the UDP Inspector yet Ruth Kelly is requesting changes which may fundamentally affect the area that local people have chosen to live in and work towards building a sustainable community. If you want to support keeping Rotherhithe, Dulwich and Nunhead suburban write to Ruth Kelly. A sample open letter, kindly written by Brian Hodge, can be downloaded by clicking here. Add your name and address and send it to the address on the letter. Ken Livingstone, Mayor of London, Greater London Authority, City Hall, The Queen's Walk, London SE1 2AA. Simon Hughes MP, House of Commons, London SW1A 0AA. Conrad Phoenix, the owner of Canada Water Site C now called Waterside View, are now working on their own proposals, aims and aspirations for the site. This is not the same as the British Land/Canada Quays proposals for that site. It is currently occupied by two single storey retail warehouses, which house Decathlon and a large area of surface car parking. Their plans include a new 2 level Decathlon store built on the current main site but with flats above and other retail/cafe/restaurants at various places on the ground level with outside seating areas for the summer. All vehicle servicing will be underground. New landscaping will be installed along the edge of the dock. Where the existing gap between the two dockside Decathlon stores is will be a new walkway with a water feature running on one side the length of the path between the two new buildings. This will extend from Surrey Quays Road to the dockside. The view across the existing wooden bridge, above. Balconies and roof gardens will have views across the water and Conrad Phoenix hope the scheme will make Eco-Homes Excellent standard. There will be secure car-parking underground. A number of ecological initiatives have been planned including bird boxes on trees and buildings, bat bricks and nesting boxes, new trees and other planting using native species of known wildlife value and 'brown' roofs to provide new habitats for birds including the Black Redstart. There will be a new tree lined boulevard along Surrey Quays Road. The report of the Government's Planning Inspector after the Public Inquiry of April 2006 recommended that the appeal by Barratt Homes (East London) Ltd against Southwark Borough Council be dismissed and planning permission refused for the development in the form proposed, but Ruth Kelly, the Secretary of State for Communities and Local Government, chose not to abide by the Inspector's recommendation and ruled instead that Barratt's appeal be upheld. As it happens, Ms Kelly agreed with the great majority of the Inspector's findings, including the crucial one that the development would not be in keeping with the present neighbourhood and would alter it drastically, but she then went on to make it clear that the Government's housing targets now take precedence over all other considerations. Barratt's response was that they were grateful for the Secretary of State's intervention and that they now hoped to begin work on preparing the site by the end of this year. It is open to anyone to challenge the Secretary of State's decision on purely legal grounds, and notice of an intent to do so (with a summary of the reasons) has to be lodged by 18 September. This isn't to say, though, that other forms of challenge, those of a less formal variety, can't also be mounted, and the Downtown Defence Campaign are currently engaged in encouraging as many as possible of their supporters both inside and outside Southwark Borough Council to keep fighting the cause. For example, as has been reported in Southwark News, Simon Hughes, our MP, has already called upon Ms. Kelly to reverse her decision. If you would like copies of the Secretary of State's decision letter (this includes information about the procedure for making a legal challenge) and the Planning Inspector's report, please email jeremy.pender@btinternet.com. As the Downtown Defence Campaign's own updates page (http://www.russiadockwood.ukfriends.com/html/updates.html) suggests, seeking a remedy through legal channels alone is just one of possibly several available courses of action. For example, nothing more might now be needed to convince Ms Kelly of the error of her ways than for her to be told in no uncertain terms that representatives from practically every single household in the Downtown Road area and their friends and relatives from across the borough are already committed to presenting themselves at the entrance to the site at the mere first whiff of an approaching bulldozer! Please note that, in accordance with council assembly procedure rule 3.10(3), council assembly shall consider this motion. Council assembly notes that the planning committee rejected an application from Barratt Homes for a development on Downtown Road and Salter Road on August 16 2005 on the grounds of density, height, massing and overdevelopment of the site. Council assembly also notes the success of the Downtown Defence Campaign in bringing together support from the local community, local councillors, and local London Assembly Member to oppose the development. Council assembly welcomes the outcome of the recent public inquiry in which the independent inspector upheld the council's decision to reject the planning application. Council assembly therefore notes with regret the decision of the Secretary of State for communities and local government to overturn the decision of the planning committee and impose the development on the Downtown Area. Council assembly notes with concern that this action further erodes the powers of local communities and locally elected representatives to make decisions about their local area. Council assembly asks the leader of the council and/or executive member for regeneration to write to the secretary of state requesting that (a) the government respects local decisions and the views of independent bodies such as the Planning Inspectorate, and (b) she withdraw her direction on the Downtown decision. Council assembly also instructs the acting borough solicitor to seek urgent legal advice as to the possibility of a judicial review of the decision. 1. The appeal relates to a development of 252 dwellings in seven separate buildings, plus a new health centre and two community buildings, with associated car parking and landscaping. Planning permission had been refused by the Planning Committee in August 2005, and a public inquiry held in April 2006. In the period between the Planning Committee and the Inquiry, the scheme was slightly amended to reduce the number of residential units from 268 to the final figure of 252 dwellings. 2. The Inspector’s report recommended that the appeal be dismissed, on the grounds that Block A/B (close to Russia Dock Woodland) would cause harm and be contrary to some of the provisions of the development plan. The secretary of state, in her decision dated August 8 2006, agreed that harm was caused, but concluded that the benefits of the proposal, in terms of the delivery of housing, particularly affordable housing, the community benefits and the overall design were material considerations sufficient to outweigh the harm to the development plan. She therefore allowed the appeal, and granted planning permission subject to conditions and a Unilateral Undertaking under S106. 3. As part of the council's appeal procedures decisions that go against the council are assessed to see what implications there might be for implementing the council's development plan policies and if a challenge of the decision through judicial review is appropriate. Accordingly, in this case the acting borough solicitor has already instructed counsel to advise on the secretary of state's decision and in particular: to advise the council about the prospect of success of a legal challenge against the secretary of state’s decision dated August 8 2006. The effect of this decision on the council’s development control processes including future negotiations with developers. The secretary of state has made and issued the decision and is not empowered by law to withdraw the decision. The right of appeal under Section 288 of the Town and Country Planning Act 1990 would, if successful, result in the High Court quashing the decision of the secretary of state and remitting it to her for reconsideration. The court has no jurisdiction to consider the merits of the planning application. The secretary of state would still need to take into account only relevant considerations in reaching any decision. These would not include any further representations made by members about matters of general policy. The secretary of state could confirm her previous decision but would have to justify it. 6. Officers are considering counsel's advice. Making an application for review of the decision is strictly time limited and must be made by September 19 2006. Under the council’s scheme of delegation, it is for the strategic director of regeneration to decide whether to lodge an appeal. 7. Irrespective of whether any legal challenge is made it remains open to members to make representations about the extent to which the case illustrates the failure of the planning system to allow local elected authorities to strike a fair balance between competing interests in accordance with its judgment about what is best for its area. Such representations could refer to Southwark’s successful record in securing additional housing including high proportions of affordable housing and indicate that overriding local decisions makes it more difficult to sustain the confidence of local people that such outcomes will be achieved with fair regard to local factors. It is not without considerable anguish that I find myself writing as the Regeneration Spokesperson for the Southwark Labour Group to entreat you to reconsider your decision to allow the above appeal and with that grant planning permission for this large development. The local community have fought long and hard to defend their beloved area against this kind of intensive building. 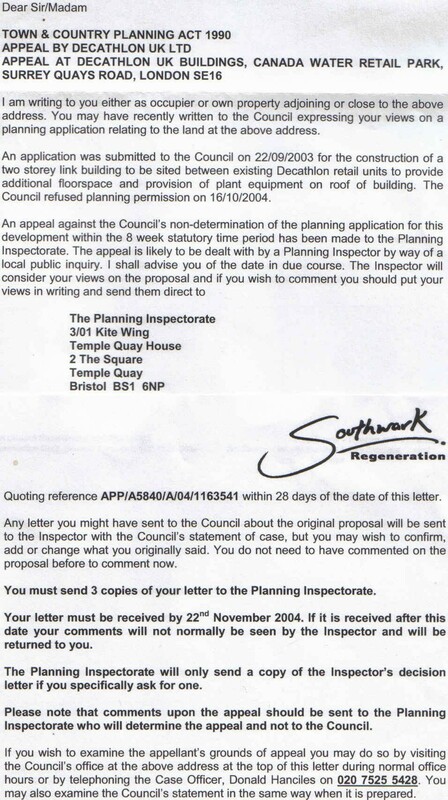 Both the Planning Inspector, Elizabeth Fieldhouse, DipTP DipUD MRTPI, and the local planning authority, the London Borough of Southwark in considering the scheme (Southwark Council reference – 04-AP-1721, dated 17 September 2004, as amended prior to the public enquiry held by the inspector) were of the view that any merits this scheme may have are outweighed by its negative impact on the local environment and its compatibility with the proper aspirations of the local community. I am not presuming to re-order your arguments you have so carefully set out to explain your decision, but instead am obliged to bring to your attention the highly likely dissonant impact on the community these development works on the land at Downtown Road and Salter Road would have if they were to proceed. Local people living and working on the Rotherhithe Peninsula were in a state of shock when they learnt of the decision to reject the Planning Inspector’s recommendation not to grant planning permission to application (as above) to develop the land on Downtown Road and Salter Road, Rotherhithe. This shock has now turned to a growing determination to resist this development at every level. Hence this letter on behalf of Southwark Labour Group in the hope and belief that it can be resolved without the local community needing to resort to further detrimental means, for instance one leading local resident is seriously threatening to use his family home as a means to raise money to challenge your decision by seeking a Judicial Review. These are very difficult times for everyone involved in this matter, but unless there is decisive movement by your Office on behalf of the residents, many of us are harbouring real fears about how this situation is going to play out in the local area. Further to the consideration of the motion on the 'Downtown Area Development/Secretary of State for Communities decision' at council assembly on 13 September 2006, there was a special meeting of the executive at the Surrey Docks Watersports Centre on Monday 18th September. At the meeting it was unanimously agreed to lodge an appeal under Section 288 of the Town & Country Planning Act 1990 to challenge the decision of the Secretary of State (Ruth Kelly) to grant planning permission in respect of land at Downtown. Last night Crawley also decided to challenge the Secretary of State regarding a planning decision which overturned a Planning Inspector's recommendation! Southwark Council will take the Secretary of State to court to fight for more sensitive housing development in the borough. Last night (Monday), an emergency executive meeting was held to decide if the authority should call for a statutory appeal against the government's ruling on a large-scale planning application. Members agreed to take the matter to court because they are not happy with the detail of the proposed development of land at Downtown Road and Salter Road, in Rotherhithe, South London. Southwark’s planning committee refused permission for the scheme in the summer of 2005 and the Planning Inspector re-inforced this position when he dismissed an appeal from the developers. Despite this, the Secretary of State over-ruled the council in August and reversed the decision, granting planning permission. Southwark Council believes the application does not fit with current planning policy, but does want to see development on the site. Southwark has a strong record of encouraging and managing new development for the benefit of all the borough’s residents, and is committed to contributing to the wider economic and housing needs of London. But in this case, Southwark agreed with local people that the proposed scheme was not suitable, and some adjustment was needed. Members said it was not about stopping development - it was about finding the best way of providing new homes which suit both those living in them, and those living nearby. The council accepts that the Secretary of State is best placed to give recommendations when there are overriding national considerations about a development. But members believe that is not the case here, and this overruling appears to have been made without adequate explanation. "We remain outraged that the Secretary of State has overruled both our planning committee and the planning inspector's decisions on this development which is strongly opposed by so many local people. “Southwark is committed to development in the borough and on this site. There are numerous approved projects which will bring quality affordable housing and community facilities to the borough. “We have sought a solution with government outside of the legal process. Ruth Kelly's failure to respond to our representations means that there is now no alternative to legal action. “This example of the Government's flawed attitude to local decision-making has repercussions far beyond Downtown. We will now defend the rights of local people and this planning authority to make our own planning decisions." 1. A successful judicial review would only require the Secretary of State to reconsider the issue – it would not force a change of policy. 2. Southwark’s duty to residents is a core reason why it develops and works to a Unitary Development Plan. This has been the subject of extensive consultation with residents and interested parties and is specifically designed to ensure sensitive development. This UDP was consulted when debating the proposed scheme, but has been contradicted by central government. The council has released the first part of the draft report from the planning inspector. This report states his recommendations for the adoption of the Southwark Plan – also called the Unitary Development Plan (UDP). At this stage the report is for information only. What is the Southwark Plan? The Southwark Plan sets out the policies for making planning decisions about developments in Southwark. What is the draft inspectors report? The draft report provides information about the inspector’s recommendations for the Southwark Plan. As this document is a draft it may change. Please note these recommendations are made by the inspector in his expert opinion and are not legally binding for the council. Which parts of the draft inspectors report are being released now? Only part one and the employment, life chances, housing and transport chapters are being released. The environment chapter is not being released at this point as it is still under consideration by the inspector. The two parts of the inspector's report are very large so we have extracted those bits which relate to Canada Water. Click on the links below for either the relevant parts or the full report. To view these forms you need Adobe Acrobat installed on your computer. If you do not have it click here to download it free. When will the final inspectors report be available? It is expected the inspector will release the final report at the beginning of May 2006. It's a goodnight from me but all being well funding for the CWCF Administrator post will be secured from somewhere and the Forum will continue to be an independent voice, representing the interests of all the people of Bermondsey & Rotherhithe for a long time to come. I am particularly sad to be leaving at this point in time. The very first planning applications for sites within the Canada Water area have recently been submitted. One could say that CWCF’s real work is only just beginning. After 4 years of intense debate and discussion on the needs of the whole community, including more family housing, better transport, more doctors, nurseries, community and youth facilities, schools etc. and ensuring that they are reflected in the UDP and SPG it would have been interesting to have been able to see all those needs and aspirations reflected in the scheme for sites A & B. The next scheduled CWCF meeting is Monday 3rd April. Due to the May 4th election certain restrictions are placed on the activities of prospective political candidates and parties. It has therefore been suggested that 3rd April meeting will take the form of a workshop to find out how YOU would like CWCF to evolve and move forward. I sincerely hope people do not take their eye off the important issues ball and spend all their valuable time and energies trying to define the perfect constitution and committee format. Being a very keen historian the old saying ….Nero fiddled whilst Rome burnt is constantly springing into my mind. Meanwhile if you have a view please write to contact@canadawater.org or post your comments here and the Executive Member for Regeneration and Rotherhithe Ward Councillor Jeffrey.Hook@Southwark.gov.uk . Please keep checking this website for up to date information on all things Canada Water. Alas Southwark’s web site is woefully out of date despite a formal undertaking to keep up to date to within 2 months. Goodbye & good luck to you all - it's been a privilege to have worked here and met so many wonderful people. I hope you ­ and the 395 bus - all live long and prosper! 1. The proposed extension would result in a poor layout and arrangement that would be detrimental to the safety and security of pedestrians using the walkway between the shopping centre and Greenland Dock, contrary to Policy E.1.1 ‘Safety and Security in the Environment’ in the Southwark Unitary Development Plan and Policy 3.16 ‘Safety in Design’ in the draft Southwark Plan (Nov. 2002). 2. The proposal would result in the loss of a well designed public area, and its replacement by a poor quality design for this part of the shopping centre, in particular the public areas, contrary to Policies E.2.5 ‘External Space’; E.3.1 ‘Protecting Amenity’; and E.3.4 ‘Upgrading the Environment’ of the Southwark Unitary Development Plan, and Policies 3.2 ‘Protection of Amenity’; 3.14 ‘Quality in Design’; and 3.15 ‘Urban Design’ in the draft Southwark Plan (Nov. 2002). Download plan The extension is shown in turquoise and the road has been re-routed. The car park nearest the red iron bridge has been removed allowing for a wider footpath to the Greenland Dock underpass. These plans seem to address all the points made by CWC and the objections given in the refusal of the planning permission. We expect Shopping Centres Ltd. to submit the new proposals shortly. LBS rejected the application from Decathlon (03-AP-1813) to join their two buildings with a two-storey construction with plant on the roof on 16 October. However, Decathlon have appealed against this decision (click here to view) and you may wish to comment on the application which would close the public piazza / popular pedestrian route at night moving all pedestrian traffic via the ill lit alternative near BHS. Please take a look at theplanning application put forward for this site 03-AP-1813 (click here to view). British Land & Canada Quays Ltd.
British Land/Canada Quays has been chosen as the preferred developer-led team to masterplan development at Canada Water following extensive public consultation. Southwark Council and the community selected this team after looking at the results of this summer's public exhibition, a MORI survey, a schools project, meetings with community groups, and all sorts of other consultation exercises. The decision comes at the end of an 18-month long competition to find a master development partner who should be capable of delivering a masterplan that will bring a real community focus for the Rotherhithe peninsula. The Council is now involved in a three month negotiation period with the preferred developer where it is looking at the information from the consultation process as well as financial and legal discussions. 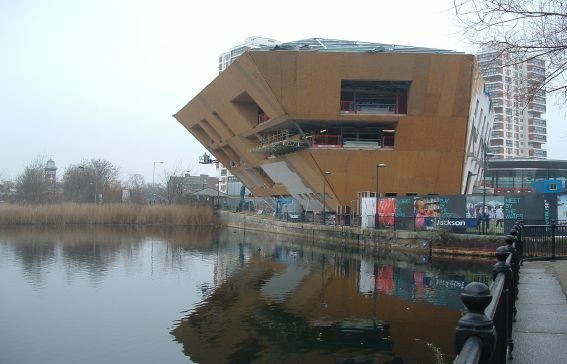 British Land/Canada Quays would like to create a hub of community facilities around Canada Water dock including a new library and community resource centre, a swimming centre, department store and new public spaces. There will also be new homes with mixed tenures, offices and small business space. The winning team's director Andrew Walton says: “We are very excited about being selected as the preferred developer. There is a lot of work for us all to do to take things forward. “We are keen to listen to what the community has to say. The plans for a boardwalk across the water have already been removed because this idea was not acceptable to local people.